With headquarters north of Dryden, Texas, King Springs Ranch is located 50 miles South of Interstate 10 on Texas Highway 349, about 25 miles West of the Pecos River, and 30 miles north of the Rio Grande. Isolated in the middle of Terrell County, King Springs Ranch is a 15,000 acre working livestock ranch made up of rugged hills, canyons and brushy draws which provide excellent habitat for a good population of whitetail deer, blue quail, mourning dove, turkey, javelina and a few predators (mountain lions were bagged from deer stands during the 1997 and 2003 Whitetail seasons). 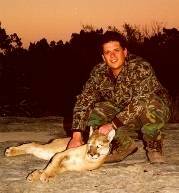 There are no fees if you happen to shoot a mountain lion, bobcat or coyote. 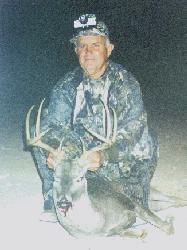 King Springs Ranch has had a game management program in effect since 1993 allowing nothing smaller than eight point bucks with antlers spread outside the ears to be harvested. Does, long tined spikes and a few bucks with deformed antlers have also been harvested. Approximately 40 tons of alfalfa pellets, corn, milo and cottonseed are fed annually in free choice feeders and automatic feeders located throughout the ranch. This is supplemented with mineral blocks containing high protein and calcium content. Our accomodations include quarters complete with bunks (bring sleeping bag), bathroom and outfitted kitchen. We also have a walk in cooler to store your deer. Whitetail bow season begins in October, rifle season runs from the first weekend of November through the first weekend of January, and black powder doe hunting runs from the end of rifle season through the month of January. Lodging is provided and hunters are responsible for meals, license, personal gear, weapons and transportation. Hunting is done from stands overlooking feeders, or rimrock overlooking canyons. Each hunter is allowed to harvest two mature dry doe, one mature Whitetail buck (8 points or better with a spread outside the ears) and one Javelina. A 50% deposit is required on booking and the remaining balance is due September 1st. Turkey hunting at King Springs Ranch is done in the spring from the last weekend in March through the first weekend in May. Lodging is provided and hunters are responsible for meals, license, personal gear, weapons and transportation. Ranch personnel will take to you a "sweet spot" where turkeys are known to roam, but it is up to you to whistle 'em up. The bag limit is two bearded birds.